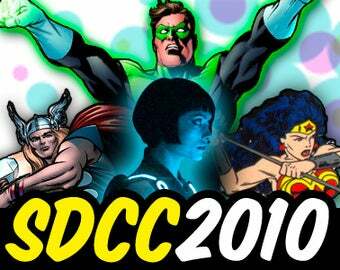 The Saturday Comic-Con schedule is up — Green Lantern, Thor, Venture Bros, and more! Comic Con's Saturday schedule is up, and it is absolutely gobsmacking. There are dozens of panels, including a discussion with Scott Pilgrim's Bryan Lee O'Malley, a first look at Green Lantern, and Kevin Feige talking Thor and Captain America. Here's but a small sample of the schedule. You can read the entire line-up here. 11:45-1:15 Warner Bros.: Green Lantern, Sucker Punch, and Harry Potter and the Deathly Hallows- Warner Bros. showcases three eagerly awaited upcoming new films in this Hall H presentation! Green Lantern- Get a first look at the upcoming sci-fi action adventure Green Lantern, directed by Martin Campbell. Green Lantern is an epic adventure that crosses galaxies to bring to life the legendary Silver Age superhero Hal Jordan, who is chosen by the ring itself to become the first human member of the Green Lantern Corps and take on the vast and powerful Parallax as it threatens to destroy the world. The film stars Ryan Reynolds as Hal Jordan, Blake Lively as Carol Ferris, Peter Sarsgaard as Dr. Hector Hammond, and Mark Strong as Sinestro. Sucker Punch- Fasten your seatbelt for a sneak peek at the dark action fantasy Sucker Punch, from director Zack Snyder, who previewed his films 300 and Watchmen at past Comic-Cons. A group of young girls escape the dark reality of their lives through their vivid imagination, which takes them to various fantasy locations in different realms. The ensemble cast features Emily Browning, Abbie Cornish, Vanessa Hudgens, Carla Gugino, Jena Malone, Jamie Chung, and Jon Hamm. Harry Potter and the Deathly Hallows-Every saga has a final chapter. Kick off the year of Harry Potter with a first look at the coming screen adaptation of J. K. Rowling's final book in the series, Harry Potter and the Deathly Hallows, with a program created just for Comic-Con fans. One way. One hero. One destiny. Don't miss it! 12:00-1:00 The Venture Bros.- Creators Jackson Publick and Doc Hammer host a laissez-faire chat about-what else?-The Venture Bros. They'll be joined by Patrick Warburton (voice of Brock Samson) and James Urbaniak (voice of Dr. Venture) as they screen sneak preview clips from the upcoming season, shamelessly plug their new DVD and line of action figures, and take questions from the audience. 1:30-2:30 Spotlight on China Miéville- Multi-award-winning author and Comic-Con special guest China Miéville talks about his books — including The City & the City, and his most recent, Kraken — in this special Spotlight panel. 4:00-5:00 Scott Pilgrim Vol. 6: Scott Pilgrim's Finest Hour vs. The Fans- It's been six years and six volumes spanning over 1,000 pages, and you've been there since the beginning! But there's always been one burning question itching at the back of your brain that you thought would never be answered. Think no more! Ready your Q's, mind your P's, and join Scott Pilgrim creator Bryan Lee O'Malley for a battle royale as he quibbles the quips of his worst enemies...his fans! 6:00-7:00 Marvel Studios: Thor and Captain America: The First Avenger- Producer Kevin Feige and special guests give you an inside look at the ever-expanding Marvel Cinematic Universe.